Many of you, dear readers, probably noticed that site Dopotopa.com has not been renewed. There were important reasons for that. I had been modernising site from the New Year to the middle of May, without that I could not post any new articles or photos. 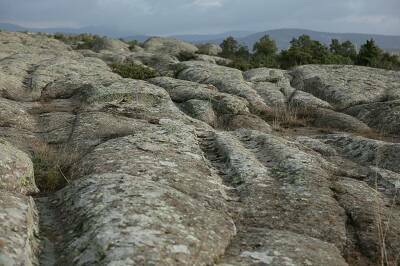 I was in expedition in Spain second part of May, where I studied entrances to under and above ground megalithic complex, fossilised roads and tracks, dolmens, seids and other megalithic structures. I took part in the new expedition in Caucuses at the end of June, beginning of July, where I researched Sochi dolmens. Last nine months I also worked on "Palaeography, climate and Eurasian states in Pleistocene" grant, with the purpose to answer questions about reasons for Pleistocene and Pleistocene-Holocene catastrophes, Proto-Indo-Europeans exodus from their northern ancient motherland. So, all this time I was with you, only site work went almost unnoticed for wide audience. Everything changes though. I started to add to the site a month ago, materials and photographs put aside and received during last expeditions and grant researches. Among other, written by me and my colleagues during last six months articles, new photos of Crimean rock towns, Cappadocia's fossilised tracks, big number of photos and descriptions of mysterious objects in Spain and Caucasian dolmens. Among them, stone roads, fossilised tracks and foot prints of three toe, straight walking creatures and animals. You will see all this in my site very soon. It will be renewed regularly like in old good times. For now, I continue to post photographs and make comments about them, try to write with fresh memories on the road a small article about Neogene fossilised roads and fossilised wheel tracks in Mediterranean region. I have already touched this subject looking at Phrygian plain and Crimean fossilised tracks. Now, after trip to Spain and research of large quantity of new fossilised wheel tracks, roads and three toe, straight walking creatures foot prints, the need to summarise all information has come about. Stone tracks, called cart ruts (tracks left by carts or carriages) are widespread on Earth. They can be found in big numbers in Turkey (Phrygian plain, Cappadocia), Crimea (Chufut-Kale, Eski-Kermen, Bahchisaray), Spain (autonomous regions of Valencia, Murcia, Castilla La Mancha, Castilla Leon, Andalusia, Galicia, Catalonia), Malta (Malta and Gozo islands), Italy (central Italy, Sardinia, Sicily), Azerbaijan (Apsheron peninsula), Kazakhstan (Caspian sea shore). There are many of them in Mexica, USA. They are known in Germany, France, Portugal and some other countries. transport vehicles in continental middle-late Miocene tuffs and tuff like sediments, with formed cluster groups sized up to 40x25 km***. Wheel width is about 23cm (at the bottom of the track) without treads. Distance between outside edges of the wheels is from 150 to 160cm, roughly the same as in modern passenger cars. Such tracks go in big numbers in parallel courses merging and crossing each other. More detailed information about the first type fossilised wheel tracks position was sent to me by A. Kuznetsov, my partner in Turkish expedition and participant in Phrygian plain and Cappadocia tracks expeditions. 1) Region: region on the map, underlined on stone track edges. Usually, it is connected with bedrocks - tracks end where there is no tuffs. 2) Group: localised track clusters, usually few square kilometres. There are no tracks beyond group, even if there are tuffs. 3) Cluster: directly connected tracks, they either go together or come out of one point. Region in Phrygian plain from Sofca mountain (South-West from Ekesihir mountain - A.K.) in the north to Kayihan mountain (to the north from Afinion and Gazligol mountains - A.K.) in the south, there are clusters within this area. This region has length of about 75 km and width of 10-20 km. Big groups in this region are discovered only in the south - at the first 20 km from Kayihan to Doger mountains. There are about five groups like that. We researched the biggest of them: to the east, north-east from Kayihan and in the south, west, south-west from Emre Golu lake. There are also some small groups. Tracks throughout 75 and even 20 km do NOT go along region space but on the contrary they are perpendicular to it, most typical track's directions are north-east, south-west. Big groups, in their turn, are divided in clusters. There are several basic clusters in regions, which we researched, tracks in clusters are usually rather parallel, which means they go in the same direction. Cluster length in Phrygian plain is usually 100-200m, you will not find more than 600-700m. Gümüşler mountain (near Nigde mountain in the south) is 166x100km, that is between far edges. There are many empty patches over there. Groups are fairly numerous, including small ones but there is one main (40x25km) rich with clusters. Clusters in this group can be much longer than in Phrygian plain. One can find 5km groups of parallel tracks (around 10 in numbers). There is a suggestion that long clusters go in all directions from towns, that is they were connected in past with points which are inhabited now. This is almost obvious. The second type of fossilised wheel tracks can be found together with stone roads cut or, as I showed in my work "Stone basins, graves and wells of Turkey, Israel, Bulgaria - fossilised structures dug in soft Miocene layers." It is rather dug in middle-late Miocene, seldom Palaeo (Crimea) layers (ground), amassed in continental, lagoon or sea shore conditions. Tracks are within roads, they often go parallel to each other, overlap or make wide grooves from few track joining. In other words, they show the same pattern as modern tracks on the narrow soil road after rain. The width of the transport vehicles tracks is less than in the first instance. It is usually from 9 to 12cm and from 16 to 18cm (at the bottom of the tracks), although we saw tracks only 5-6 and 8cm in widths in some places. The distance between tracks is from 132-145cm (more often) to 170-180cm. Roads make lengthy widespread systems of old highways, they split into two or three, connect, climb up in serpentine on rock towns (Chufut-Kale and Eski-Kermen in Crimea, Castellar de Meca and Tiermes in Spain), and then follow for tens and hundreds kilometres to other rock or underground towns. Stone roads profile more often is U shaped with even vertical or almost vertical sides with heights from 10-20cm to 2-3m, in some places up to 4-6m, with often narrow steps, 10-40cm high in lower part of their sides. Road width between sides is 157-160cm in Spain and from 2 to 3m in Crimea. The width between transport vehicles tracks, roaming on such roads, is 140-150cm in Spain. V shaped profile roads can be found rarely. Wheel tracks are well distinguished on many stone roads or their parts. There are a big number of so called "Roman roads", which have U shaped profile, vertical sides (from 10-20cm to 4-6m high) and even fossilised or covered by soft Quaternary sediments and soils roadbed. 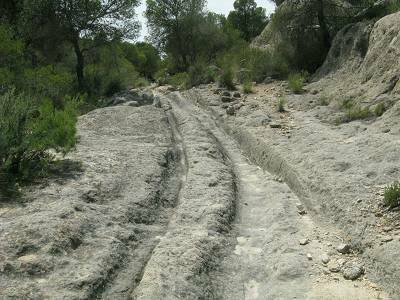 Many parts of the roads are almost or completely covered by soft Quaternary sediments, they can be determined on site, basically, by hollows, ravines and other linear relief elements (ancient road of Tiermes Burga de Osma in Spain, Etruscan-Roman road Via cava in Italy and others. Usually, such roads are clearly seen on aerial photos and Google maps. 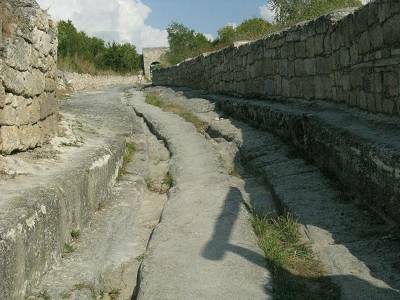 Ancient roads are also often found in archeological research under modern soil roads. There are many places, where roads cut in stone (or dug in soil and fossilised) run in big length under Quaternary sedimentary cover and the soil road with modern transport vehicles traffic runs directly above. Apart from two mentioned main types of fossilised stone tracks, there is the third, transitional type. It contains elements of both other fossilised wheel tracks types and appears where stone roads join or cross tracks from one time use by wheeled transport vehicles. 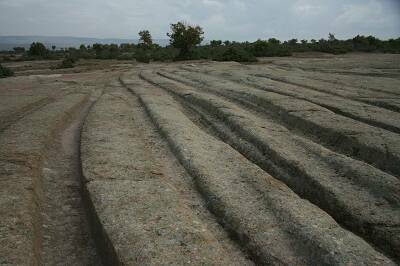 We saw such stone roads and tracks dispositions in Castellar de Meca (Spain). Many years of our field research and review of published works allow us to say about not only single and close spaced clusters of fossilised tracks but also stone roads. 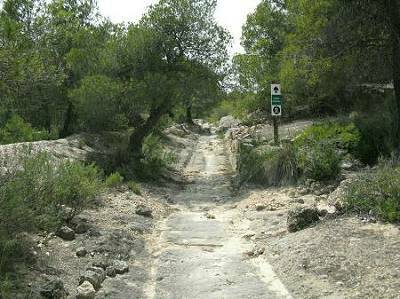 For example, there are few places within Spain, where such roads stretch for tens and hundreds kilometres (Tiermes-Burgos, north of Madrid, Bocairent Onteniente, historical road Ontur in Murcia). The presence of fossilised roads and tracks in different parts of Spain (autonomous regions of Valencia, Murcia, Castile la Mancha, Castile Leon, Andalusia, Galicia, Catalonia) indicates of common widespread ancient roads network stretching throughout whole of Iberian peninsula. At present time their biggest part overlaid by soft Quaternary sediments, the roads come up to the surface together with bedrocks (Neogene surface of straightening) in mountains, high places and in a form separate tectonic blocks among fields. Similar network of fossilised roads likely exists in mountainous Crimea, which is confirmed by descents and climbs of stone roads from different slopes to rock towns Chufut-Kale and Eski-Kermen. 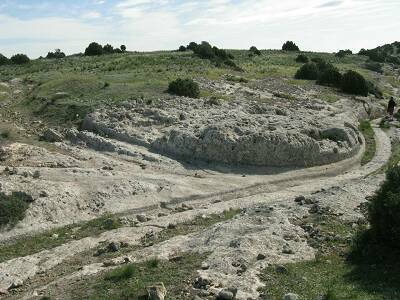 Also it confirmed by their overlays of soft Quaternary sediments in valleys and parts of fossilised roads episodic appearance in different places of mountainous Crimea (Bahchisaray). Some parts of so called Roman roads (Etruscan-Roman road Via Cava and Roman road Via Clodia) can be put to ancient roads, stretching from Rome to Mancino for more than 150km, at least in occasions, where they have structure analogous to stone roads in Castellar de Meca, Bocairent (Spain), Chufut-Kale (Crimea) etc. As a rule, there are ruins of Etruscan settlements or Etruscan necropolises in places close to such roads. "Roman roads" exist not only in Italy but in Israel (Atlit), according to Uwe, researcher from Germany, in Germany and France. According to results of research of satellite photographs by A Kuznetsov, some of the fossilised track clusters spread around points with habitable settlements 1-4 sq. km in area. Settlements with area more than 4 sq km are usually situated not on tuffs, that is why they do not provide any statistics. Despite on widespread existence of stone roads and tracks, their study is carried out on a very limited scale or not at all. 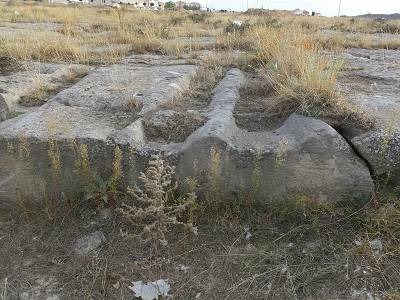 So, there were no information about fossilised stone tracks in Cappadocia until recently. If it was not for A Kuznetsov, who discovered tracks on Google map, possibly, the world would have been unaware of them, being sure that except for underground towns, there is nothing else interesting in Cappadocia. 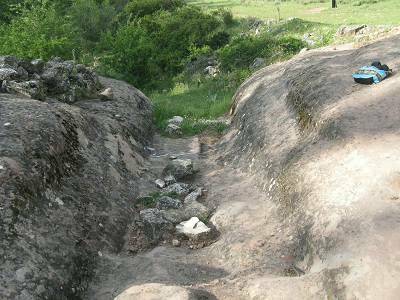 Fossilised stone tracks in Phrygian valley, spread on the territory from town Eskisehir in the north to Afyon in the south, are mentioned only in single work: Yasemin Ozarslan. The cultic landscapes of Phrygia. Middle East Technical University, Assist. Prof. Dr. Geoffrey D. Summers, 2010, also at the conference in Ankara in 20-22 March 2014 "PATHWAYS OF COMMUNICATION Roads and Routes in Anatolia from Prehistory to Seljuk Times." Spanish tracks are also almost unknown to English speaking and even more so to Russian speaking readers. They are described basically, without details on Spanish tourists sites. Fossilised stone tracks of Malta are more lucky. Number of publications are dedicated to them in English and even Russian. They are benchmarks in this kind of things. 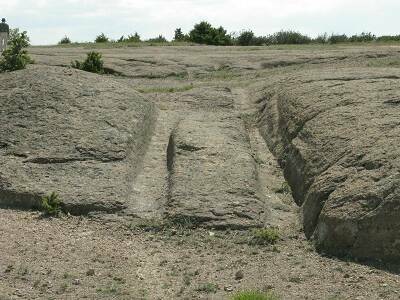 Russian publications (reports and articles) often mention Crimean stone tracks. However, my experience in communication with English speaking audience showed that most foreigners know nothing about Crimean tracks. 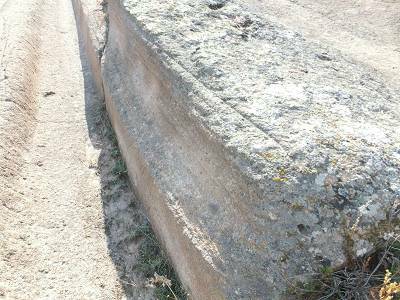 Publications, reports, articles and notes about fossilised stone tracks say that they were left in historic times (as a rule from II or I millennium BC to XVIII AD) by loaded carts or carriages with metal rims or without. Roads developed by deepening the road surface in soft tuffs, limes, sandy and other soils as a result of multiple use by loaded carts. It looks approximately like this. Carts were going-going and dug tuffs, limes and sands by their own weight to the depth of 6m for 50-100, possibly, few hundred years, leaving in this case perfectly straight vertical or almost vertical slopes from both sides of created by them gorges. In other words, for a hundred years, they carried out such work which would have been done by a spring or river for millions of years. Also, they shaped roads in ideal U profile with vertical sides and straight angles. This version or prevailing point of view among archeologists looks "interesting ". How real is it? I showed incompetence and vulnerability of official theory in my works (Automobile roads (cart ruts) of the Neogene time in Central Turkey, Humanitarian mission in Neogene - heroes saving hostages of deluge (continuation of the article "Automobile roads of Neogene period in Central Turkey"), Crimean petrified wheel tracks - the Neogen roads etc) in many places. 1) Fossilised tracks and roads everywhere look the same, however, they are dated differently in different places (from III-II millennium BC to XI-XVIII AD). Since tracks themselves do not contain any organic remains, their age is determined by bordering underground rock complexes, which were supposedly built by different civilisations (Phrygians, Iberians, Etruscans, Sarmatians, Khazars (Karaims), Goths, Cimmerians, Romans, Byzantines) living from II millennium BC to II millennium AD. I wrote many times (e.g. "When were rock and underground towns of Mediterranean built? Geologist's outlook (thoughts after trip to Crimea)") that it is wrong to attribute absolutely the same roads, tracks and rocky underground complexes to different epochs and cultures. I expressed thoughts that they were created by one common world civilisation, spread over Mediterranean-Himalayan and Andes regions. This civilisation existed well before appearance of Hittites, Phrygians, Thracians, Iberians, Etruscans, Karaims and other nations, which supposedly built underground rock towns and stone roads. 2) Biggest part of stone roads and tracks is situated in rock formations, developed in middle-late Miocene of Neogene period (15.9-5.3 million years ago). They concentrated in rock formations with different age only in few places (Palaeocene and Eocene epochs of Paleogene period, 66.0-41.2 million year ago in mountainous Crimea, possibly Cognac-Santon layer of late Cretaceous, 89.8-72.1 million year ago in Spain and Brazil). Composition of track's rock formations varies. It can be tuffs, ignimbrites, sands, limes, marls, gravelites, conglomerates and such exotic rocks as calcarenites, biocalcatenites and biomikrits. Almost all of them were amassed in continental conditions (bogs, lakes, rivers, deserts etc. ), sea shores and lagoons in other words, onshore or shore periodically flooded by sea (further developed into Neogene surface of straightening). Tracks correspondence to a) rocks of the same age and b) rocks developed as a result of lithification (petrification) of sediments precipitated on shore or periodically flooded shore, cannot be explained by carts going on bedrocks hypothesis. You have to agree, cart's drivers were indifferent to the age and surface of the roads: Neogene, Cretaceous, Devonian or Proterozoic, amassed on shore or ocean bed, all of them were solid. Most of the mentioned bedrocks are so solid that one can chip off a pierce only with the help of hammer or sledgehammer. How could cart's wheels (even with iron rim) had left tracks 40cm deep or more, without destroying track's sides? Sides of the tracks are absolutely straight, vertical without cracks, splits, chips. They don't have any traces of deformation characteristic to applying pressure to matter in solid state. At the same time, many tracks have distinctive traces of plastic movement (subsidence, dislodging, mixing etc.). It agrees very well if wheeled transport vehicles had been driving on still soft, unfossilised sediments of Neogene ground, lakes, lagoons or sea shores. It is hard to explain, how carts could drive on the same track, sometimes very winding without one or two sides and not slip off tracks during many years. Moreover, the study of the tracks showed, that it is not true - several parallel and crossing tracks can often be seen on the roads. 3) Studied and well preserved tracks appeared to be wheel prints in soft substance (such a plasticine, cement, clay) with distinctive scratches on track sides made by wheel axels and pushing out soft substance (soil) to the track sides. Such soft substances were volcanic ash, clays, sands, lime and other sediments. They fossilised after wheeled transport vehicles drove on them. The process of fossilising supposedly could had taken from few months to few hundred years depending on climate conditions. 4) Research of the modern mountain roads in Crimea and Caucasus, with constant 4x4 traffic for many years, showed that modern wheeled transport vehicles do not leave any tracks (prints) on hard limestones and sandstones and leave very small prints (few millimetres) on limestone or sandstone gravel. Their clearly seen traces (tracks) appear only on soil road parts. Water periodically runs through old tracks turning them into deep trenches between latest tracks with more perfect form. Tracks on non steep slopes with relatively dry ground make two shallow wide strips in time. 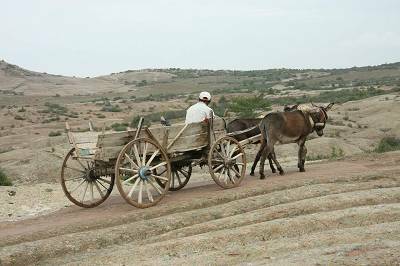 Similar picture we saw on many stone roads and tracks, which also contradicts the version of carts going on rocky ground. Modern soil roads on plains also remind fossilised stone roads. Soil roads are usually two wide and not deep parallel strips, each of them 2-3 times wider than a track if the ground is hard and dry. If the road goes through wet lower ground (beside river, lake, offloading of ground waters etc.) or if the locality has regular rains, such roads have distinctive tracks deeply set into the ground. Skidding and muck mixing marks, one track is more distinctive etc can be seen on the lowest parts (holes, pools). The same picture was noted on few patches of stone roads and tracks. It is impossible to explain by carts driving on bedrocks but it is perfectly well explained by wheeled transport vehicles (cars or off roaders) driving on wet soil roads. 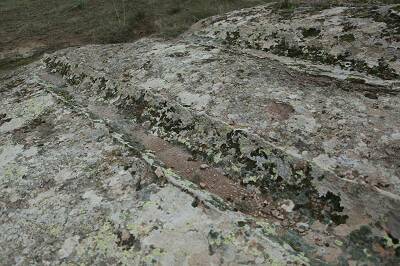 In some places (Bocairent, El Padul in Spain) we saw fossilised stone roads with road surface, consisted of fossilised gravel as a binding material - similar to gravel in soil (enhanced soil road), cement (concrete road), bitumen (ash felt road). The tracks can be seen only in places on such roads. Road base is often even. However, loaded carts traffic in historic times would have left tracks, isn't it? It means that wheeled transport vehicles similar to cars or off readers, not carts, were driving on stone roads. It was long time ago. (usually input and discharge) from Quaternary and Pliocene sediments, as our research in Phrygian valley showed. There are many places where tracks stop abruptly by tectonic disturbances such as input and discharge and then Quaternary sediments continue metre and half a metre beneath them. They are often ploughed (especially in Spain) by farmers and peasants. Neogene surface of straightening, containing tracks (despite of the bedrock types) quite often is overlapped by soft Quaternary and possibly, Pliocene sediments. Taking into account that the age of Quaternary sediments is 2,6-0 million years, Pliocene sediments is 5,3-2,6 million years, tracks hardly can be less than late Miocene (11-5,3 year ago) in age. developed thin veins of hydrothermal materials. 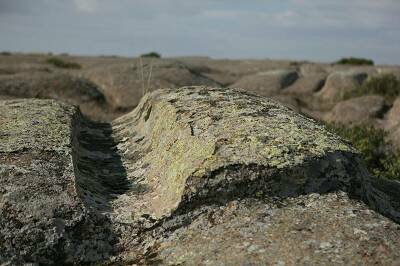 Often they have contours smoothed by erosion and covered by thick crusts of weathering peeling off the main bedrock. In many places tracks look so old - subverted to water erosion and other exogenous factors, that there are no doubts in their ancient age, equal or almost equal to Neogene surface of straightening. In my previous works (Automobile roads of Neogene time in Central Turkey etc) I showed that surface of straightening dates as middle-late Miocene on geological maps and works on determining absolute age of bedrocks. It's layers (layer - lesser division of stratigraphic scale) dating on different geological maps (Spain, Turkey, Crimea) allows to suggest that tracks were made during the period from 15 to 7 million years ago. Between 15 and 7 million years ago, the area of Mediterranean region was covered by big quantities of underground rock towns and dense road network with automobile or some other wheeled transport vehicles traffic. 7) Ground narrowing and subsidence within single track and road, seen by us, Is another important argument in favour of impossibly of forming tracks in historic times by loaded carts. 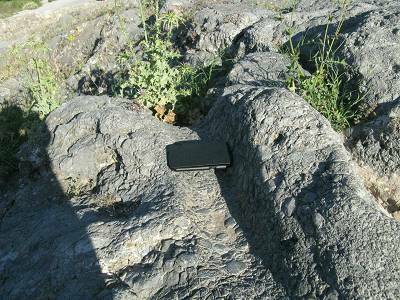 We documented few places in rock town Tiermes in Spain, where tracks with distance 205cm (from the track's top), get closer on a slope to 95cm (with track's width 12.5-13cm) and then widen again to minimum 143cm. Pedestrian staircase was made on one of such patches on steep slope in later times. Of course, this could have happened only if the road and tracks existed when the ground was wet and soft. It was unlikely to happen later than Neogene. We could have brought many other arguments in favour of inconsistency of hypotheses for making stone roads and tracks by loaded carts in historic time (they viewed in many reports and articles of mine), however, even mentioned facts are enough to show that Earth was densely inhabited at least in Mediterranean. Read my other new works on the Neogene civilization "Humanitarian mission in the Neogene – the heroes who saved victims of flood who had taken refuge underground (continuation of the article “Automobile roads (cart ruts) of the Neogene time in Central Turkey”)", "Crimean petrified wheel tracks - the Neogen roads", "When were the rock and underground towns built in Mediterranean region? Geologist view (reflections after a trip to the Crimea). Part 1. Critics of official dating for the rock and underground towns", "Global Distribution of Ruins and Other Material Traces of a Neogene (15-6 million years ago) Civilization in the Mediterranean Region", "Middle Earth - the real country of the Neogene period"